Welcome to a special edition of Bore Off! 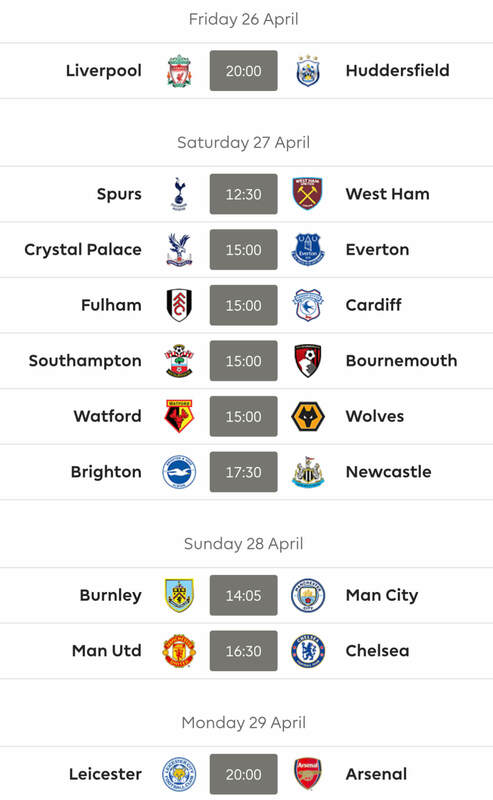 Usually we only run these during the International breaks, but this time we decided to throw one in since we had a few extra days between GW’s. 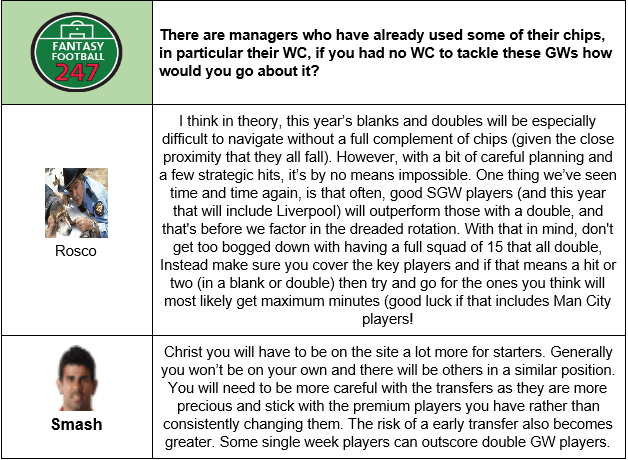 You will notice a slightly different format as there are nowhere near as many questions and we have asked our guys to expand a bit more than usual on the six they did get. This GABO is focused on the blank and double game-weeks to come. 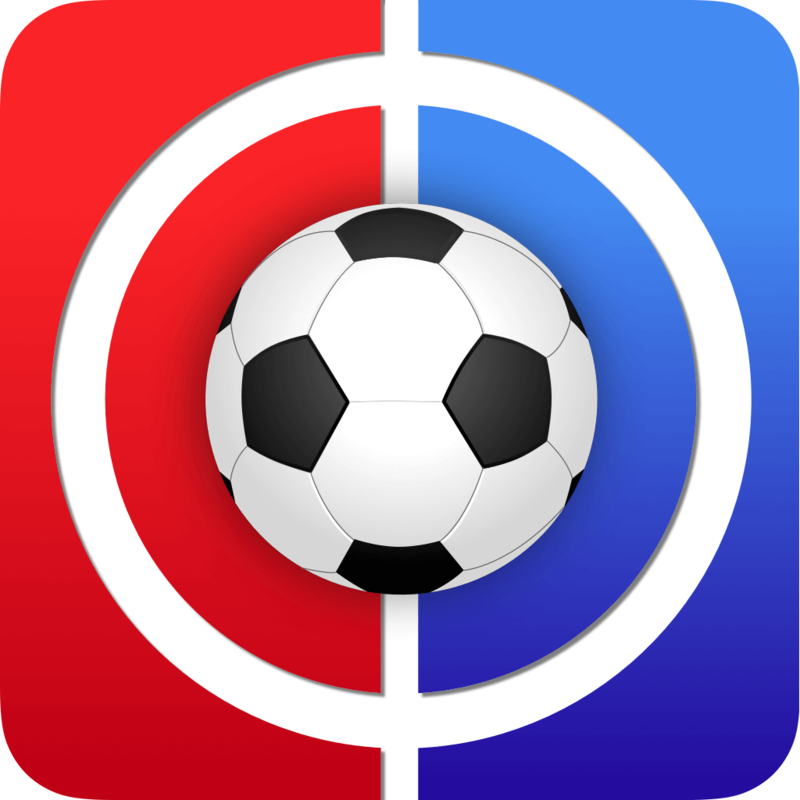 Obviously, we can only talk so much without knowing what teams will actually be a part of the actual doubles and blanks and as we see the FA Cup start to dwindle down teams we will address what players/teams and possible strategies you should be considering, but that will come in due time. Now for a quick intro of our two guests. In charge of group gathering coordination, captaincy article writer and overall good guy, please give a warm welcome to Rosco, but not too warm as he gets comfortable and falls asleep. 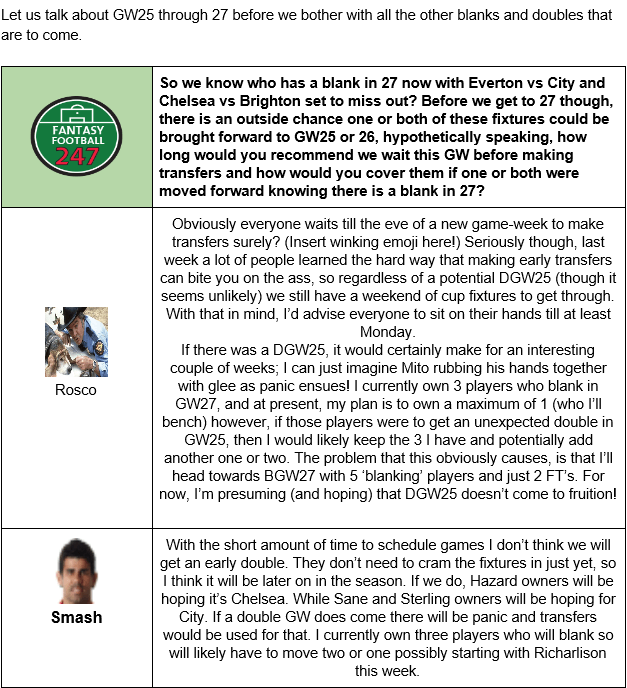 Rosco enjoys spending his free time ruining his FPL team and playing with his dogs Mike and Ashley. We assume he is married, but he really only talks about his dogs, so not sure on that. Our second man is site favourite, Smash. Always quick to help with average advice. He naturally saves all the good moves for himself, that is why he is ranked inside the top 20k and all the people he helps are outside 100k. Smash has taken time from his busy holidaying schedule and offered to contribute, even if he does have to use dodgy hotel wifi. What a guy!! Let’s get on with it and we hope you enjoy. And of course give a follow to the one and only, GABO hall of famer, Monsieur Olivier Giroud. 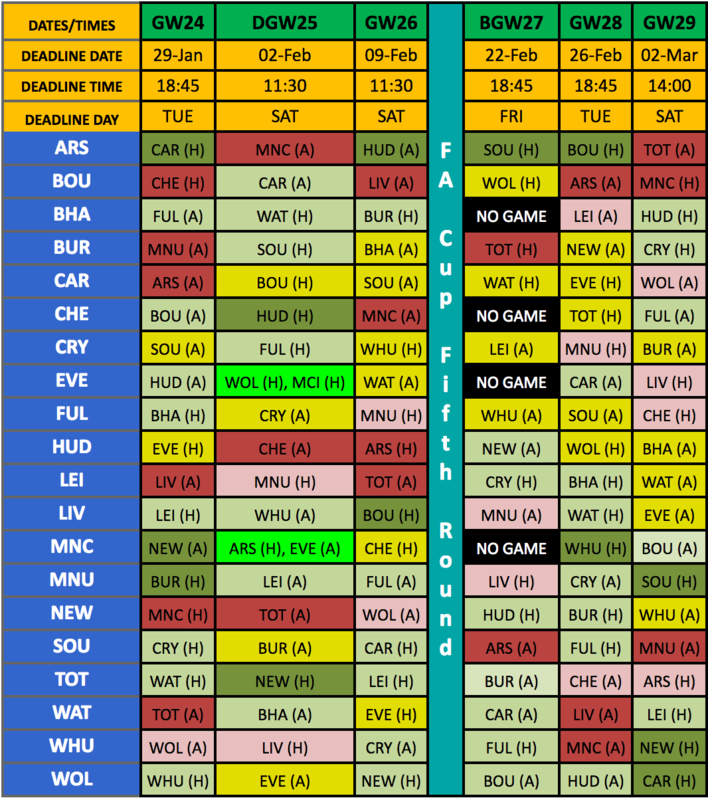 Planning to do Pea to Kun after GW24. 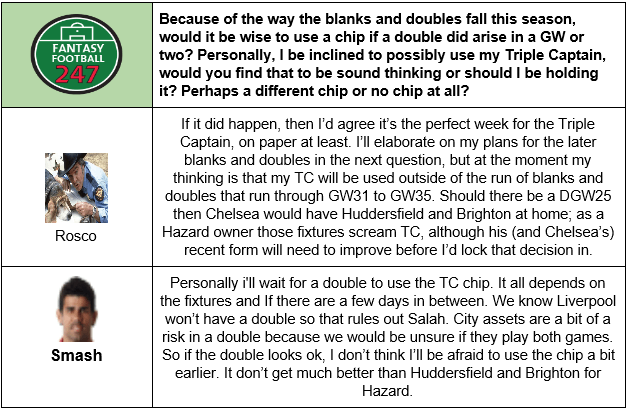 When to use the TC is tricky as DGW27 is not ideal, but likely will wildcard in DGW32 and BB in DGW35. Unless a well planned wildcard in 30, FH31, BB32, shortish team for 33, TC35. 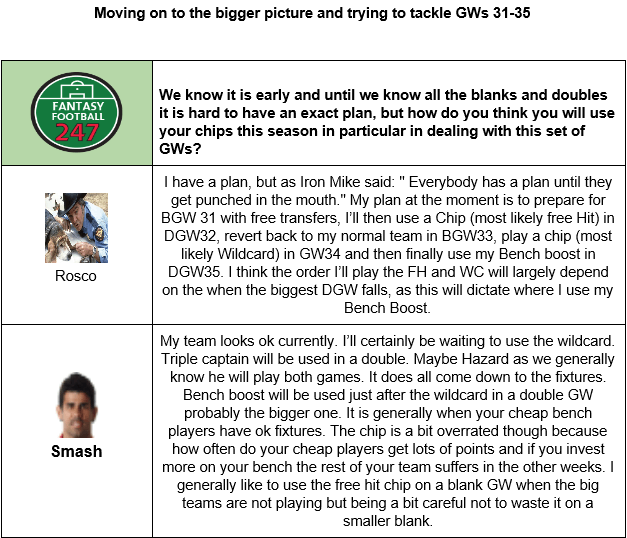 Yea tricky to navigate those gws Blank 31- Double 32 – Blank 33- Double 35. 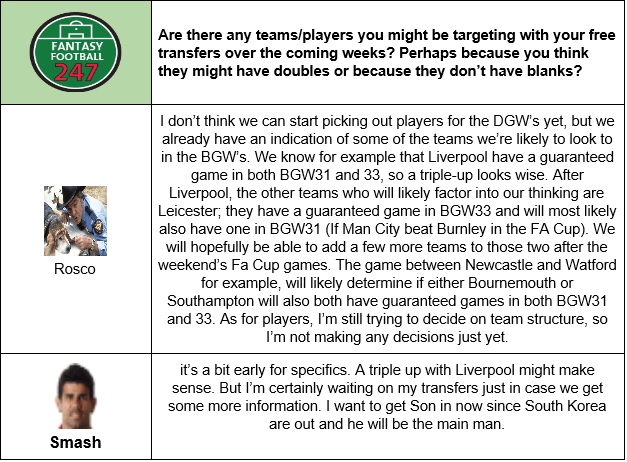 Is GW37 a potential DGW for Chelsea? Evening everyone, I have 2 fts and 0.9 itb. I don’t think it’s worth it bringing in anymore Everton or City players but don’t know what I want to do. I am thinking of doing one move just so I don’t lose an Ft and its a short term one. What do you think of Hamer to Button just so I don’t have to play Etheridge against Arsenal? What do you think? When is Ryan back? The Aussies were knocked out on Friday. Were they? I didn’t see that. That should be the same as Son then and SSN say he won’t be back in time for midweek. Judging by what Poch said today I’d expect Son to feature on Wednesday night. Brighton play Tuesday so I’m not sure about Ryan. I might just bring Button in as he’s the same price and if he plays great, if not then I have Etheridge to fall back on. I don’t think Button is worth it. I’d be looking at one of the regular starters so you have 2 keepers for bench boost. Patricio maybe? Here’s my current team, with 1 FT and £1.3m in the bank. A couple ideas have crossed my mind – what do you reckon? I’d sort out you GK first mate so it’s 2 or 3 for me. Probably leaning towards Leno but it’s tough. Thanks, pal – have done Hennessey to Leno as the Palace player is perilously close to a price drop.